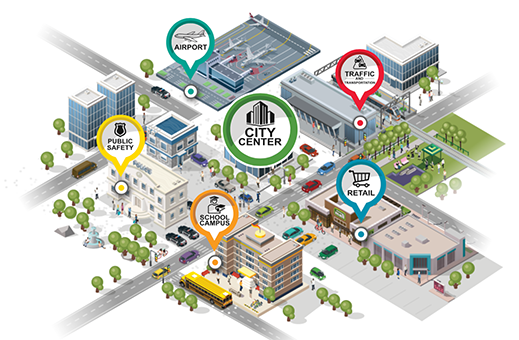 Inventum helps cities plan and deploy large scale Wi-Fi projects to connect millions of citizens. These include both indoor and outdoor venues that leverage various technologies such as smart poles, fibre to the curbside, microwave, TV WhiteSpace, power-line communications and more. Our smart citizen mobile apps and visitor sign on portals take the pain out of registering and using Wi-Fi services. We also work with mobile operators to enable seamless mobile data offload from city owned hotspots, offering a lucrative monetisation model for the infrastructure owner. With reliable connectivity, governments can improve their ability to add electronic surveillance with real-time 24x7 monitoring. Inventum works with multiple technologies that allow even remote locations to be brought on to the data grid and integrated into a smart city plan. Using Wi-Fi and multi-operator mobile data offload to take the entire nation online. This pioneering project was delivered in 2015 and linked citizen passports & mobile OTP to verify identity before access. Learn how our UNIFY SMP and SR routers have made it easy for several Indian smart cities take citizen online cost-effectively. Our made in India products meet the PMA regulations of the government of India. Contact Inventum to learn how we can help institutions and governments plan their wireless networks better. We have been in this business since 2003 with some of the world's largest deployments of Wi-Fi.